In this lesson, we will learn how to interpret a data set by finding and evaluating the experimental probability. Two coins are tossed 76 times. The upper faces are observed, and the results are recorded in this table. 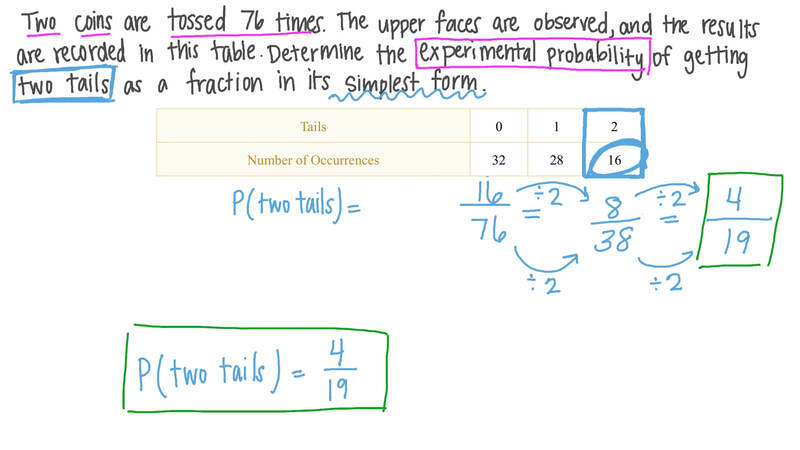 Determine the experimental probability of getting two tails as a fraction in its simplest form. The table shows the results of a survey that asked 20 students about their favourite breakfast. What is the probability that a randomly selected student prefers Eggs? A biased coin was tossed 350 times and the number of tails observed was 178. Calculate the relative frequency of getting heads. A six-sided die contains the numbers 1 to 6. It was rolled 26 times and the number of times each value appeared is shown in the table. Find the experimental probability of rolling a 4. A soft drinks factory produces 1400 bottles a day. The factory tested a sample of 400 units and found that 6 were defective. By calculating the experimental probability that a bottle is defective, work out how many defective bottles would be expected in a day. A boy flipped a coin 100 times, and he got heads 58 times. Calculate his experimental probability of getting heads while playing this game. The given fair spinner was spun 248 times. What is the expected number of times the pointer will land on the section labelled by the letter 𝐹 ? A fair spinner has 8 equal sections, one of which is green. If the spinner is spun 56 times, what is the expected number of times it will stop on the green section? A fair die is rolled 136 times. Calculate the expected number of times a number greater than 3 is rolled. A fair die is rolled 150 times. What is the expected number of times for an odd number greater than 2 to be rolled? A fair die is rolled 150 times. What is the expected number of times for a number divisible by 3 to be rolled? A bag contains 9 blue, 5 red, 3 white, and 8 green marbles. If a marble is drawn at random and replaced 75 times, determine the expected number of times a green marble could be drawn. A game at a festival challenged people to throw a baseball through a tire. Of the first 68 participants, 3 people won the gold prize, 12 won the silver prize, and 15 won the bronze prize. What is the experimental probability of not winning any of the three prizes? On an irregular die, the probability of rolling the number 1, 2, 3, 4, or 5 is equal. The probability of rolling a 6 is three times that of any other number. What is the probability of rolling an odd prime number? A die is rolled 750 times. What is the expected number of times for an even number greater than 1 to be rolled? What is the probability of getting heads when a fair coin is flipped? What is the probability of getting tails when a fair coin is flipped? If a coin is flipped once, what is the probability of getting a head? Which of the following sets represents the event of rolling two numbers which sum to 10 on two six-sided dice? If a fair number cube, labeled with the numbers 1–6, is rolled 90 times, which result is most likely to occur? AThe number cube will land on an odd number about 45 times. BThe number cube will land on 6 about 30 times. CThe number cube will land on a prime number about 60 times. DThe number cube will land on a number larger than 4 about 15 times. Suppose you roll two number cubes, where each cube has the numbers 1, 2, 3, 4, 5, and 6 on its faces. Determine the probability that the sum of the two numbers rolled is less than 12. Two fair dice are rolled. Which of the following represents the event of rolling two numbers which sum to 7? A die is rolled two consecutive times. Which of the following represents the event of rolling two numbers which have a difference of 2? A fair die is rolled twice. What is the probability of rolling two numbers which sum to an even number less than 4?